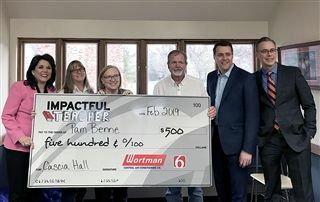 News on 6 surprised Upper School math teacher, Pam Benne, on Valentines Day by presenting her with the Impactful Teacher Award and a check for $500. Mrs. Benne was nominated by fellow faculty member, Kathleen Brown. The interview aired Friday morning on News on 6.